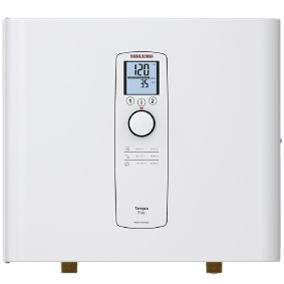 The Stiebel Eltron Tempra Plus Series features true microprocessor-controlled temperature regulation as well as a convenient digital temperature display and dial selector which allows you to set the desired output water temperature at any level between 86 and 140F (30 and 60C). It is one of the only tankless water heaters on the market that features a true thermostatic temperature control and full power-modulation based on both the incoming water temperature and the water flow rate. Tempra Plus models will automatically adjust its power output to accommodate changes in the incoming water temperature and flow rate so it can precisely maintain the desired output temperature. Tempra Plus models also feature Stiebel Eltron's exclusive dynamic Advanced Flow Control technology. This technology automatically adjusts the flow of water when the unit's sensors detect that the flow demand is exceeding the heater's capacity. This feature is particularly useful in cold climates and other applications where the electrical service size does not permit the installation of a larger model and it may be desirable to handle occassional high flow demands. It is also desirable where high output temperatures are required for temperature critical applications (commercial dishwashers, etc.) and where flow rates are not always predictable. The Tempra Plus Series is available in various power levels for a wide range of whole house and commercial water heating applications. Temperature Control Technology Full micro-processor-based thermostatic temperature control featuring digital temperature selector / display and full power modulation based on flow rate and incoming water temperature. Dynamic Advanced Flow Control Technology - adjusts the flow of water when the unit's sensor's detect that the flow demand is exceeding the heater's capacity. Prior to purchasing your Stiebel Eltron Tankless Water Heater, it is important that you ensure that your home has sufficient electrical capacity for the desired model, or that you have budgeted for any upgrades that might be necessary. Please note that all electrical tankless water heaters, regardless of the manufacturer's claim, are restricted in reality to approximately 3 gallons per minute of flow at any given time in cold winter climates. This is generally more than enough for residential applications, however, certain simultaneous water usages in the home at single or multiple outlets may exceed this capacity. Please bear this in mind when selecting a model or system for your home. See the chart on our Tankless Water Heater Model Selector page for maximum flow capabilities based on your climate and model selected. Before purchasing a Stiebel Entron, or any other electric tankless water heater, please ensure that your home has sufficient electrical capacity for your desired model, or that you have taken note of any upgrades that may be required. The above specifications are only guidelines. If your home is already equipped with a large number of electrical appliances, you may require a larger electrical service than the one recommended above. Please consult an electrician before placing an order. If your home does not have the minimum household electrical service as specified for your desired model, you can still purchase a Stiebel Eltron tankless water heater, however, upgrades to your electrical service will likely be required. It is recommended that you consult your certified electrician for a quote prior to purchasing. Please be aware that uninstalled units returned due to a home that has inadequate electrical service may subject to a re-stocking fee. Please see our POLICIES page for more details.